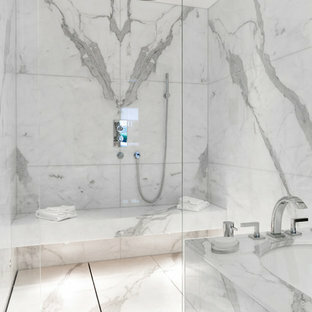 Large modern bathroom in London with marble tiles, grey walls, marble flooring, a wall-mounted sink, marble worktops, white floors and an open shower. 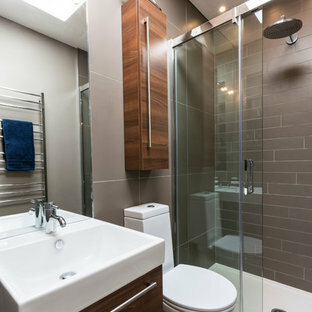 Photo of a modern ensuite bathroom in Manchester with flat-panel cabinets, dark wood cabinets, a freestanding bath, a built-in shower, beige tiles, beige walls, a vessel sink, wooden worktops, beige floors and an open shower. 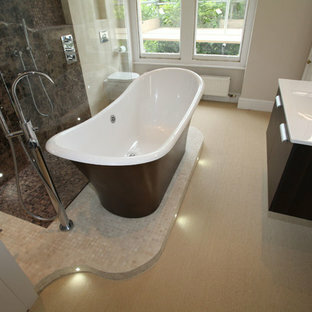 This is an example of a medium sized modern ensuite bathroom in Cheshire with flat-panel cabinets, white cabinets, a claw-foot bath, white walls, medium hardwood flooring, a submerged sink and brown floors. 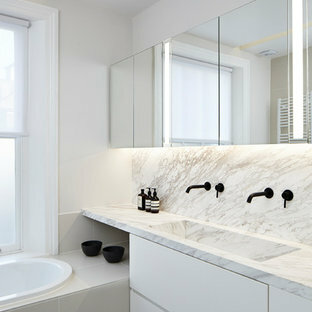 Modern bathroom in London with a wall-mounted sink, flat-panel cabinets and white cabinets. 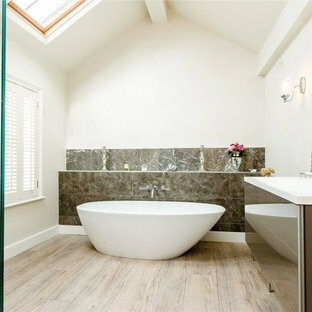 Design ideas for a modern bathroom in Surrey. This is an example of a large modern bathroom in Other. Large modern family bathroom in Kent with open cabinets, a freestanding bath, a corner shower, a wall mounted toilet, grey tiles, porcelain tiles, white walls, porcelain flooring, a wall-mounted sink and marble worktops. Photo of a modern bathroom in London. 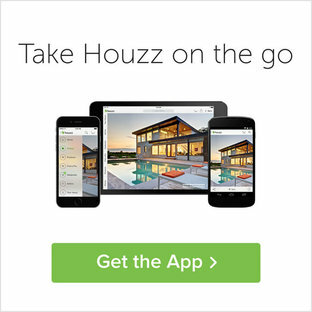 Design ideas for a small modern bathroom in Sussex. 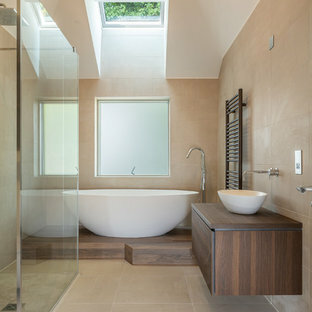 This is an example of a large modern ensuite bathroom in Other with a wall-mounted sink, flat-panel cabinets, white cabinets, a freestanding bath, a walk-in shower, a one-piece toilet, white tiles, ceramic tiles, white walls and pebble tile flooring. 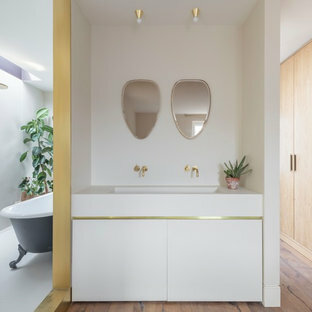 Photo of a modern shower room in London with open cabinets, a wall mounted toilet, white walls, a vessel sink, wooden worktops and white floors. Medium sized modern ensuite bathroom in London with open cabinets, a built-in bath, a built-in shower, a wall mounted toilet, beige tiles, stone slabs, beige walls, mosaic tile flooring, a built-in sink, limestone worktops, beige floors and a hinged door. Inspiration for a modern family bathroom in Dorset with white cabinets, an alcove bath, a wall mounted toilet, multi-coloured tiles, white walls and porcelain flooring. Design ideas for a modern bathroom in London. 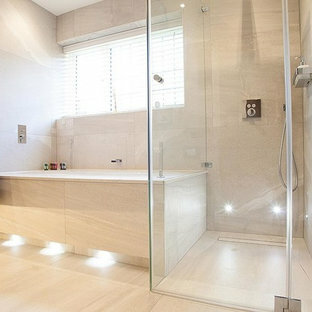 This is an example of a small modern shower room in London with a vessel sink, open cabinets, dark wood cabinets, wooden worktops, a walk-in shower, a wall mounted toilet, grey tiles, mosaic tiles, grey walls and mosaic tile flooring.